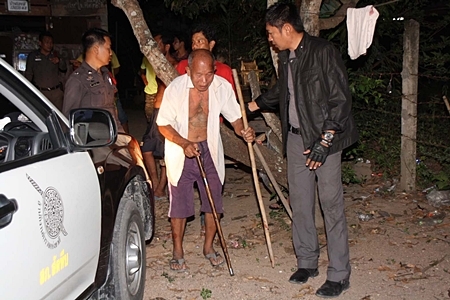 Songkran revelry turned to violence in Sattahip when a 68-year-old disabled man assaulted his drunken wife for smashing her 12-year-old grandson’s head into a wall. Somsak Sirisuwan, crippled from the waist down, was taken into custody by Sattahip police April 18 after a complaint by his 62-year-old wife Samlee. Drunk, raving and bleeding, the woman claimed her husband has struck her twice in the head with his cane. She was taken to Queen Sirikit Hospital for treatment and released. Somsak Sirisuwan was taken to the station, but later released, after it was learned he hit his drunken wife only to protect his grandson. Police said Somsak did not deny the charges, but said he only struck his wife to defend their grandson. According to Somsak, Samlee had returned home around 5 a.m. after three days of binge drinking to celebrate Songkran. Angered somehow by her fifth-grade grandson Manasnant Sirisuwan, she pounded his head several times into a concrete wall. As the child cried for help, Somsak said he crawled over to his wife and hit her until she released the boy, police said. The boy corroborated Somsak’s story, police said, and the disabled man was released without charges.